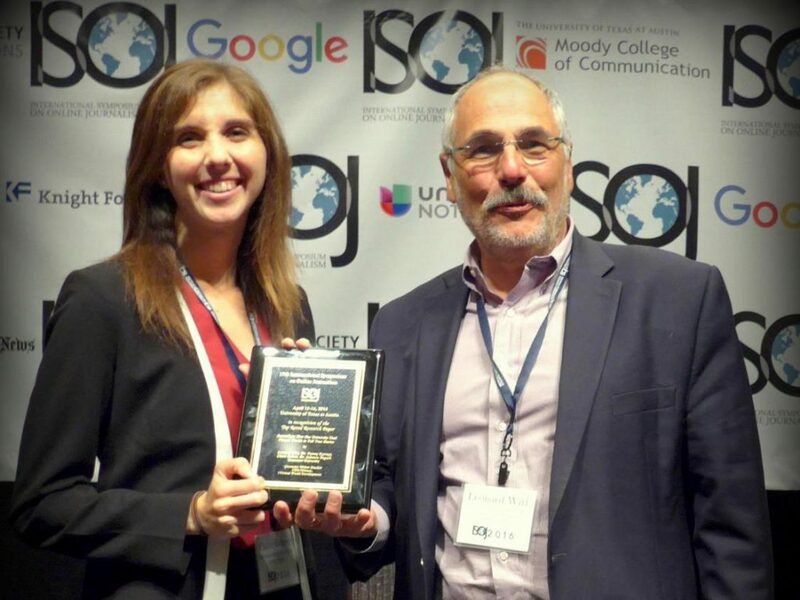 Project intern Claire Bohrer and Professor Leonard Witt at the 17th International Symposium on Online Journalism accept award for ISOJ’s Top Rated Research Paper on behalf of the entire JJIE Virtual World Journalism research team. Photo: ISOJ. After our presentation about the JJIE Virtual World Journalism Project on April 15, 2016 at the 17th International Symposium on Online Journalism, the research team was pleasantly surprised and greatly honored when presented with the ISOJ Top Rated Research Paper award for the team’s project research paper, Journalism: How One University Used Virtual Worlds to Tell True Stories, published in Spring 2016 #ISOJ, the official research journal of ISOJ. Cover art for the JJIE immersive journalism project research paper in the Spring 2016 ISOJ Journal. 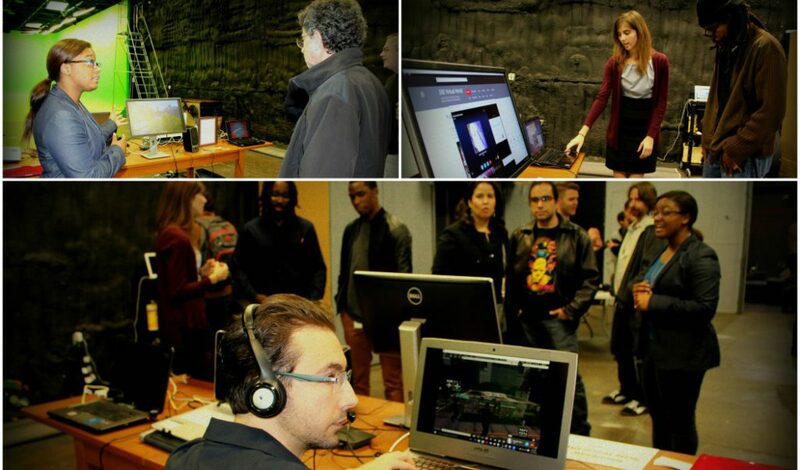 Project interns Ariel Greenaway (top left), Claire Bohrer (top right), Cristina Guerra (not pictured) and JJIE technologist Christopher Hayden (center, headphones) at the Virtual Reality Meetup at Trick 3D Gallery in Atlanta. Photos: Gallery Staff. Project interns Claire Bohrer, Ariel Greenaway, Cristina Guerra and JJIE technologist Christopher Hayden produced and ran the exhibit as they provided explanations of the project’s fruition, progression and objectives. Gwenette Writer Sinclair, our virtual reality supervisor, was also present inworld to introduce people to our JJIE world in OpenSimulator and to answer technical and best practice questions about virtual worlds and machinima. Project interns arriving to present to CNN Atlanta producers. Left to right: Jackson Walsh, Kevin Enners, Camille Moore, Claire Bohrer, Cristina Guerra, Ariel Greenaway, Anastaciah Ondieki. Photo: Len Witt. After the project closed in November 2015, the JJIE Virtual World Team presented their immersive journalism work to the world. 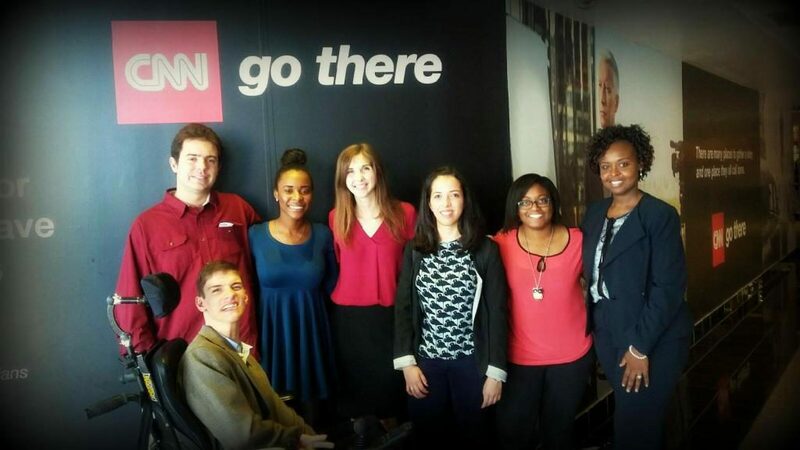 Presentations were made to CNN in December 2015, and to the students and faculty at Kennesaw State University in February 2016. The video above was created to give our grantors and audiences an overview of the project. 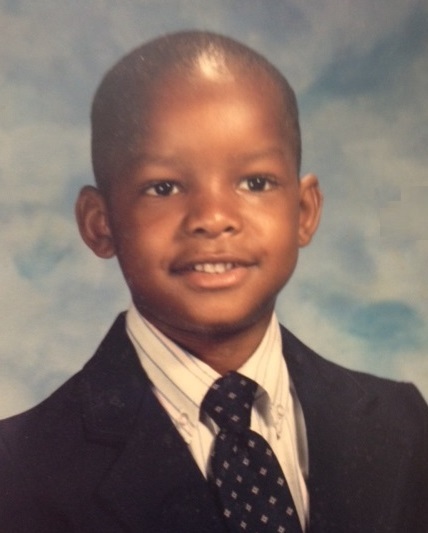 Released October 22,2015, “THE KID, THE COP, THE PUNCH”, our immersive journalism project’s proof-of-concept machinima, tells the real story of a 12-year-old boy’s encounter with a policeman in his Chicago neighborhood, circa 1990.